Lottie doll review. Have you heard of these little dolls that come with charming accessories? Learn why we love these dolls for pretend play. I discovered Lottie dolls this summer, and immediately fell in love. I was thrilled by the offer to review and run a giveaway for the company. I LOVED dolls as a kid, and as a result I have very particular things I look for in dolls for my own children. Easy to hold and carry around. Comes with accessories AND inspires kids to make accessories. Inspires my child to create positive scenarios for the doll. This is pretty intangible, but I suspect most parents could easily identify which dolls on a shelf inspire positive stories and which ones inspire demanding or even cruel story lines. Leaves plenty of room for children to create their own identity for the doll. I don’t mind if the doll has their own story, but it shouldn’t be such a HUGE piece of who they are that children feel “stuck” with that storyline. Lottie dolls are fully jointed, complete with bendable knees. I love that they look like children! 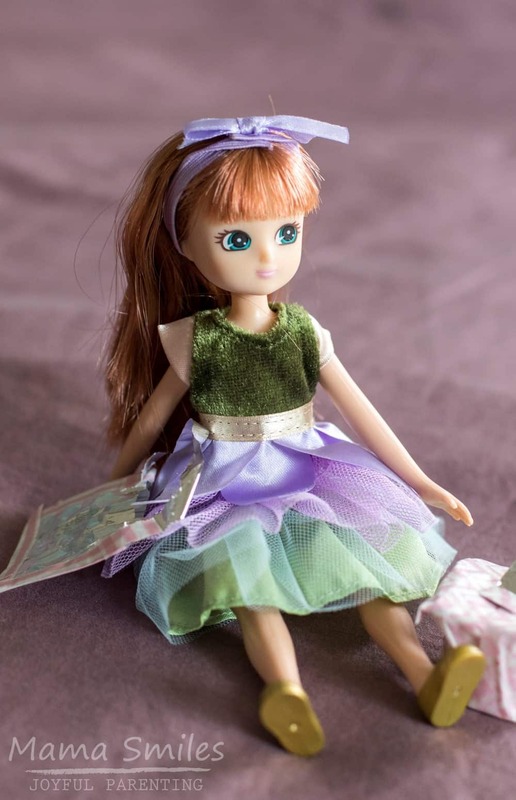 These dolls are modeled after a nine-year-old girl’s body. 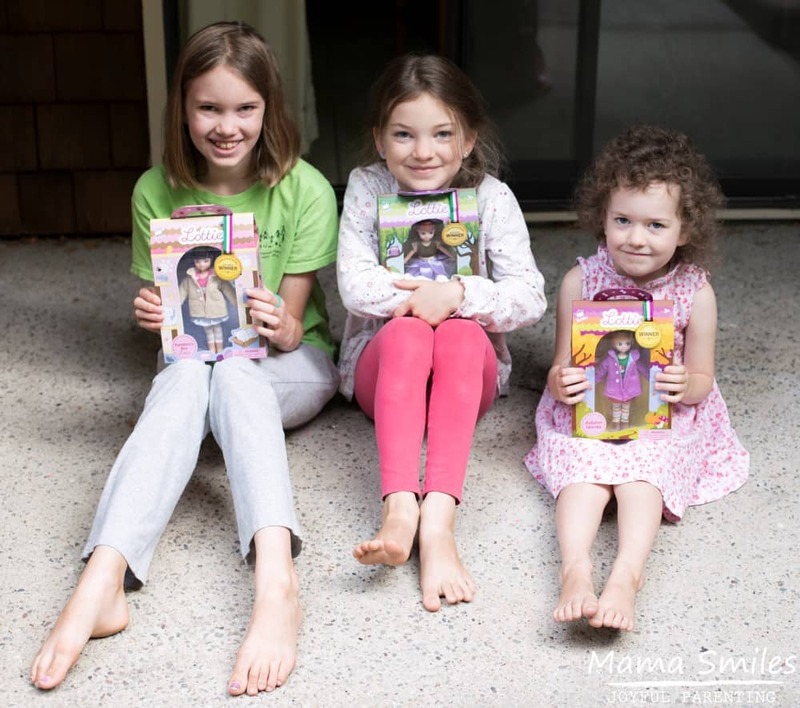 All three of my girls – aged 11, 8, and 5 years old – fell in love with these dolls as soon as they saw them. I let them each choose which doll to review. Five-year-old Anna picked the Autumn Leaves Lottie doll. Eight-year-old Lily picked the Forest Friends Lottie Doll. Eleven-year-old Emma picked the Pandora’s Box Lottie doll. My girls were so excited to see these dolls when we got back from our summer road trip! They immediately started taking them on all sorts of adventures. I find these dolls somewhere new every day. Lily has gotten the most into the Lottie doll crafting. 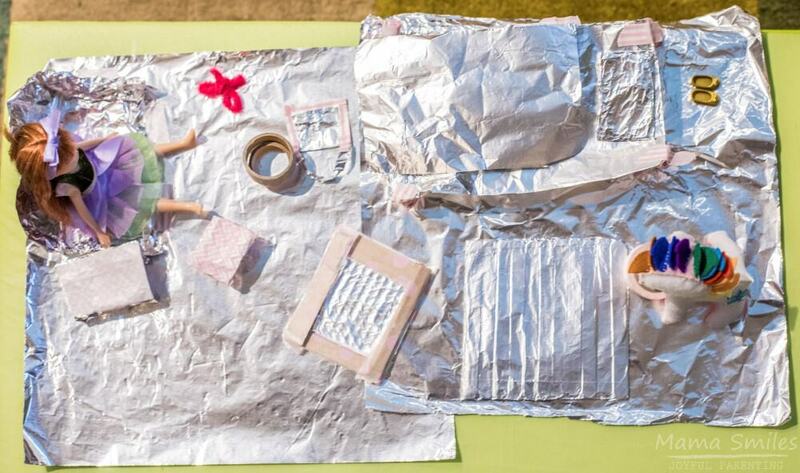 See the tiny little bag she made using aluminum foil and washi tape? She made a larger matching bag for herself, and she plans to make some clothes soon. Lottie Dolls Giveaway – Open Worldwide! 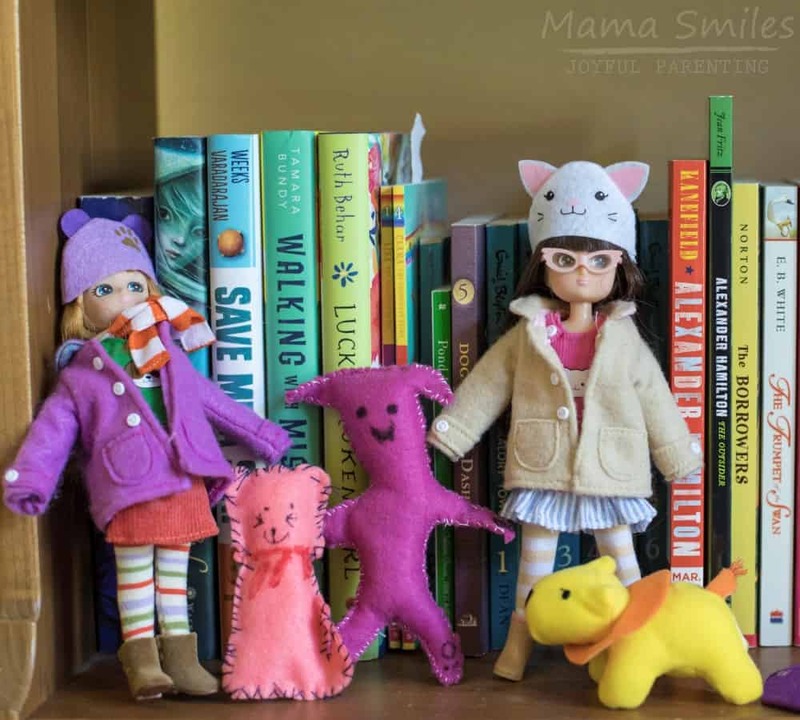 I’m excited to share that one of my readers – living ANYWHERE in the world – can select one of these three dolls to win! Please note that, if you enter, your email addresses will be shared with the Lottie Dolls company. They will not be shared with any other organization, but please don’t enter if you are not okay with your email address being shared. Fill out the rafflecopter form below to enter. US Readers: You Get a Discount! US readers, Lottie Dolls has a a 20% off code for you for just this week, which you can also share with friends and family! It will be activated for USA customers for purchases over $20 and is MARYANNE20. There are some really amazing Lottie Dolls that I would love to add to our collection! As a photographer, I was immediately drawn to Mia. 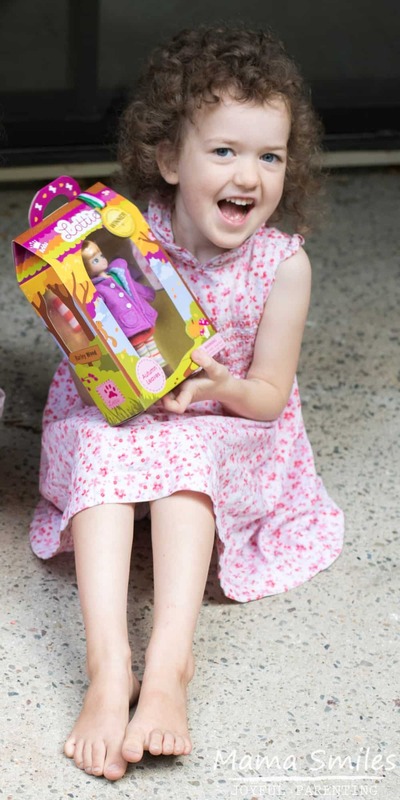 Mia also has a cochlear implant, reflecting the Lottie Dolls brand desire to celebrate diversity and inclusivity. I was equally happy to see that they included a boy doll, Finn. Which Lottie doll do you like best? 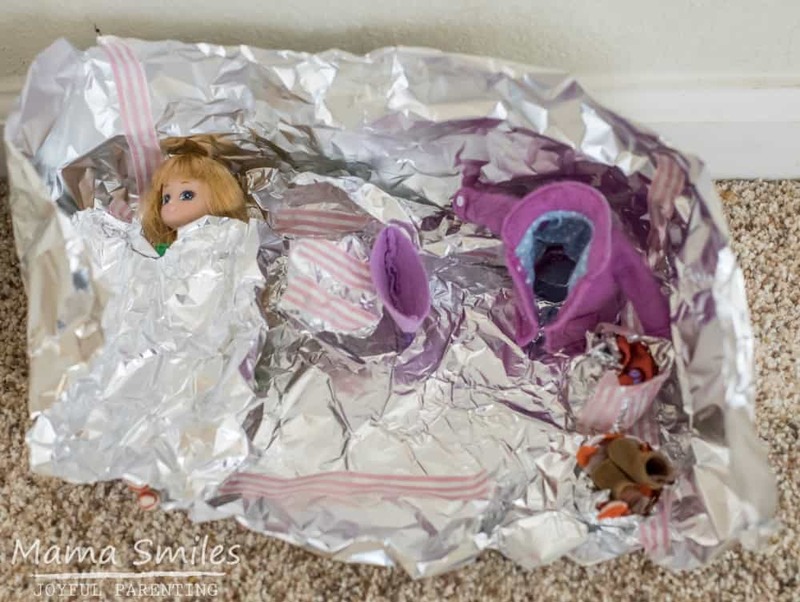 Do your kids love dolls for pretend play? Share your doll inspired play on my Facebook page, or tag me on Instagram. We love the Forest Friends doll. My daughter likes the “princess skirt” and I think she has the loveliest hair! I can imagine so many fun scenarios for these dolls! My girls love the Forest Friends Dolls. so cute and adorable! All cute, but, Pandora box lottie doll! Forest friends is my favorite, but they are all adorable! I would chose the Forest Friends Lottie Doll! These dolls look lovely! I can see why your girls enjoy playing with them! This would be a really hard choice because we don’t have any of these, but I think I’d choose Pandora’s Box Lottie. We love cats, so the design is great. And it looks like my 5 year old might be getting glasses, so she’d make a nice gift to help with the adjustment. Soooo adorable!! I would choose the Forest Friend Lottie Doll! My little one would adore her! Thanks for the chance! My daughter would like the Pandora’s Box doll. I would pick forest friends but theyre all cute! I would choose the autumn leaves doll. I would choose Pandora’s Box. I love her hat! I would choose forest friend love the dress! My daughter would love the Autumn leaves Dollie! What an awesome giveaway! Thank you so much! I would love to won the Forest Friends Lottie Doll. Pandora’s Box cat hat is so cute! We absolutely love the Pandora’s box Lottie doll. The polka dots, the cat eye glasses n the cat hat!! I am sure our lil one will carry it along everywhere and will have a lot of fun styling it!! I would chose the Autumn Leaves doll. I would choose Pandora’s box. All the dolls are too cute. I think my daughter would like the Pandora’s Box Lottie Doll the best because of the kitty hat. She has a kitty hat also and wears it every where. She will go nuts to see a doll with one too. I love the Forest Friend doll, she’s so cute. We’ve got the Ice Princess, and Wendy would play with hers all the time. I’ll have to get some of the animals to go with her doll. I would choose the Forest Friend Lottie Doll. I would pick the Forest Friend doll! If I am lucky enough to win, I’ll choose Pandoras Box doll. I just love her little kitty hat! Th e forrest friend doll. Pandora’s Box Lottie dol is the doll I would choose. I would choose Pandoras Box for my granddaughter. My daughter would like the Autumn Leaves doll the most! I would choose the forest friends! Such wunderfull and imaginative homes your girls have made for the Lottiedolls. I would choose Pandora’s Box Lottie Doll. Pandora’s Box would be a top pick. The dolls are really cute! My daughter would love the Autumn doll. Would chose the Autumn leaves. So cute. I haven’t heard about these dolls. My girls would love these and they would pick the Pandoras box lottie doll. My favorite is Autumn Leaves. Autumn leaves for my niece! Beautiful doll! I would choose the autumn leaves! Pandora’s Box Lottie Doll is so cute love one for my daughter. My niece would love Autumn. My granddaughter would love Autumn Leaves. I would choose the Autumn Leaves doll for my daughter. I will definitely be considering these for Christmas as my daughter has a bunch of barbie sized dolls but prefers to play with her smaller dolls. Autumn leaves is the one I would chose. My daughter would love the Forest Friends Lottie doll! My daughter is a tutu-princess, so I’d choose the Forest Friends doll that’s wearing the cute little tutu! Thanks! I’d have to pick Pandora’s Box – she reminds me of my daughter with the cat hat on!! If I won, I would choose the Forest Friends Lottie doll. I would love to get the Pandora’s box doll for my daughter! She would adore her! I would choose the Autumn Leaves doll for my daughter! They are all beautiful! They’re all so cute, but I would pick the Autumn Leaves Lottie Doll. 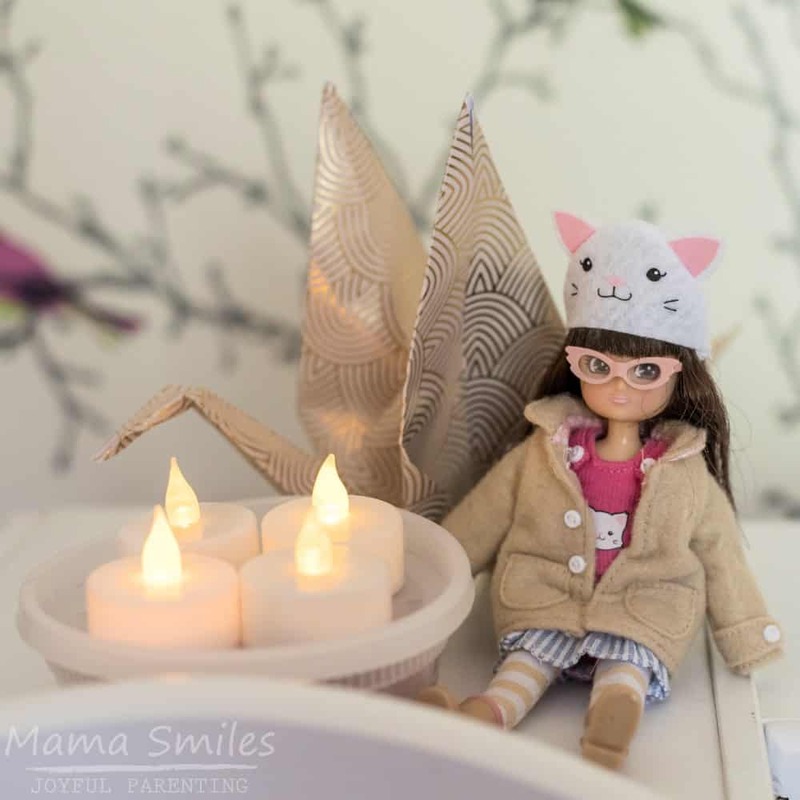 I would love to have the Autumn Leaves Lottie Doll for my daughter! I would choose Forest Friends Lottie Doll. I think the Pandora ‘s box, so cute they all are though! I would choose the Forrest Friends doll, my niece would love her. I’d let my daughter pick, but I’m almost certain she’d choose Pandora’s Box. She loves animals of all kinds, but cats especially. My daughter would love the Forest Friends doll! We love them all, but would choose the Pandora’s Box Lottie doll. I would pick Pandora’s Box Lottie doll. I would choose the Autumn Leaves. I would definitly choose the Pandora’s Box Lottie Doll. She is so adorable. My little one would love all of these but probably this one the most. My Granddaughter would love Pandora’s Box doll. It is adorable. I love the Forest Friends doll. I would choose Autumn Leaves doll for my granddaughter, she would love her! Oh Im sure the Autumn Leaves would be a big hit in my home! My niece would love Pandora’s Box Lottie doll. I really like the Forest Friends doll. I like all the dolls but Pandora’s Box combines two of my loves cats and dolls. I would choose the Autumn Leaves Lottie Doll, thanks! I would love to give the Forest Friend Lottie to my friend’s daughter for her upcoming fourth birthday! Her mom works for the Houston Ballet and she loves anything that looks like a tutu. I’d go with Pandora’s Box as a gift for my cousin’s daughter. I would probably choose the Autumn Leaves Lottie Doll. Thanks for the chance to win!